Provide comfort for the family of Winifred Roberts with a meaningful gesture of sympathy. Winifred Jane Roberts, 86, of Maxwell Rd., Clinton, NY, passed away Saturday, April 6, 2019 at the Katherine Luther Residential Health Care in Clinton. She was born March 6, 1933 in Oneida, a daughter of Harold and Winifred Maris Russell and was a graduate of Earlville High School. She married John Hudson who predeceased her. On November 24, 1961, Winifred married Lacy E. Roberts, Jr. in Hamilton. Winifred had worked for the J.C. Penney Co. in New Hartford and, at one time, had been an aide at the Martin Luther Home. She was devoted to her family who were the light of her life. Her favorite pastime was sewing. Surviving are her husband of 57 years, Lacy; her children, James Roberts of Charlottesville, VA; Jill Roberts of Morgantown, WV; Julie and Ron Tucker of Topeka, KS; Jerome Hudson of Adams, NY; Jeffrey and Gail Hudson, and Joseph Hudson, all of Whitesboro; brother and sisters-in-law, Thomas and Diane Russell of Earlville; brother-in-law, Ernest Brown of Liverpool; many grandchildren, great-grandchildren, great-great-grandchildren, nieces, nephews and cousins. She was predeceased by a son, John Hudson; two sisters, Valerie Cooper and Beverly Brown; and a brother, Wayne Russell. Funeral services will be held at 11am Thursday, April 11, 2019 at the Burgess & Tedesco Funeral Home, 3 Preston St., Earlville, followed by interment in the Earlville Cemetery. Friends are invited to call at the funeral home on Wednesday from 6-8pm. In lieu of flowers, contributions in her memory may be made to the Alzheimer’s Association. 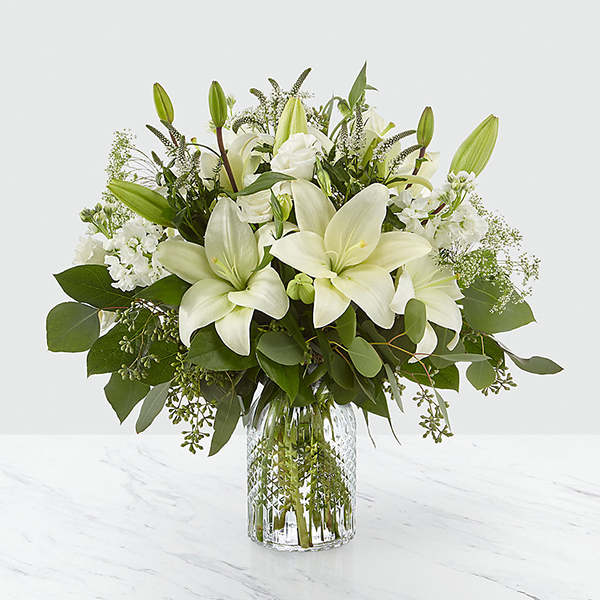 To send flowers in memory of Winifred Jane Roberts (Russell), please visit our Heartfelt Sympathies Store. Your friends at Fleetwood Drywall sent flowers to the family of Winifred Jane Roberts (Russell). Your friends at Fleetwood Drywall purchased the The FTD Deepest Sympathy Arrangement for the family of Winifred Roberts. To April and family, our deepest sympathy. Heartfelt Sympathies Store purchased flowers for the family of Winifred Roberts.